I'm so happy & surprised! I won a ribbon! Thread: I'm so happy & surprised! I won a ribbon! I entered a quilt into the county fair - this is the first time I've ever entered any sort of competition of any kind, ever in my entire life, and today when we went to the fair I was so surprised to find a ribbon pinned to my quilt!! At first I couldn't find my quilt and I was thinking, "Wow, it was so awful they didn't even hang it!" But then I found it and saw the ribbon and was so surprised! It's a 4th place ribbon, which isn't THAT impressive but I really didn't think I would win anything at all - I just wanted to enter to sort of put myself out there. And there were a LOT of really nice quilts in my category (novice, machine quilted, machine pieced) there so it's not like I was just the worst out of only 4 entries, LOL. I'm really excited & encouraged...definitely going to enter again next year! Congratulations! Your quilt is lovely! WOW, beautiful quilt!!! Congratulations !!! What a thrill! Congratulations on taking the leap and entering a quilt - it definitely deserves a ribbon. Any time you get a ribbon, it is impressive. Sometimes there are a lot of quilts in the pieced category so to get a ribbon is awesome. Great quilt by the way! Congrats on your ribbon for a wonderful quilt! 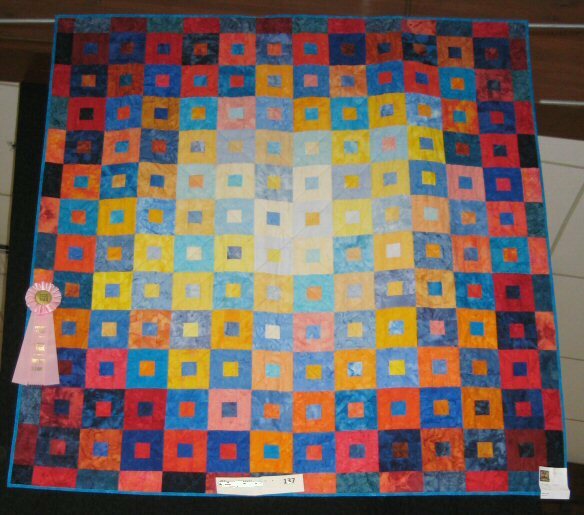 It is a beautiful quilt, and I can assure that 4th place does mean something, no matter how many quilts are entered. I've helped the judge several times at a local fair, and they have been instructed not to even give all the ribbons if the quilts don't deserve them. Way to Go.. Good Job. What a pretty quilt! And good for you to enter - that take guts, and I am so glad that your skill was rewarded with a ribbon. Congratulations! You did a beautiful job! I like the shading in your layout. I think the judges did, too. How exciting for you! It's just lovely! It is a very pretty quilt and congratulations. I am sure it is the first of many ribbons that you will win over your quilting life. Congrats! Beautiful job! I do think its that impressive! That's good to know! I'm pretty proud of my ribbon, I really can't get over the fact that I got one at all! Of course I HOPED I'd win something but I honestly did not think I would. Next year's quilt will be even better! Of course a pink ribbon is impressive, you did well! Congratulations! It's a pretty quilt and am glad you got a ribbon. How exciting, that is wonderful, congrats. way to go in taking the leap and the next one will be a different colors.